Monmouth Stereo and Video for more than 40 year engages in serving New Jersey customers for designing a system to satisfy their needs. The Monmouth Stereo and Video offers car audio, home automation, home theaters, rental and repairs of audio and video systems. The brands provided by Monmouth Stereo for furniture and mounts are JSP, BDI, Sanus, Salamander, and in audio are NAD, Marantz, Parasound, Pioneer Elite, Onkyo, brands such as PSB, Aki Mate, Monitor Audio, Sonance, Niles Audio, Rockustics in speakers. The brands that are available in Video in Monmouth Stereo are SIM 2, Samsung, LG, Toshiba, Sharp Aquos, Epson, and Seura Mirror TVS. 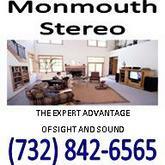 There are currently 0 consumer reviews about Monmouth Stereo available. Share your review. Please take a note that you are about to post a public review about Monmouth Stereo corporate office on CorporateOffice.com. This review will be public, so please do not post any of your personal information on this website. If you would like to contact the corporate offices of Monmouth Stereo, please use their contact information such as their phone number, website, and address listed above to contact them. However, sometimes staff from Monmouth Stereo headquarters do read the reviews on this website.